When Karen of Karen’s Kitchen Stories announced breads with levain, I was excited. Here was a theme that was going to push me to make my own sourdough starter. We were allowed to use other starters like biga, poolish, soakers, tangzhong etc. I left those options if only I failed with the sourdough. Last year my brother in law from Nairobi had given me a bit of the starter from his batch. I brought it back to Mombasa and fed it till it was nice and bubbly. I tried making a sourdough bread and the mass of dough was just too unmanageable for me. The bread failed in a big (major!) way. The sourdough went into the fridge and stayed there for a few days. Took it out and used it a bit for pancakes. After that it was forgotten! When I came back from India, of course I had to throw it away. A recent trip to Montreal and enjoying all the variety of sourdough breads was convincing enough to try making the sourdough starter from scratch and baking a doable bread. Let me warn all beginners, if you don’t have a dutch oven or something similar, baking the actual rustic sourdough bread is difficult. My starter was a bit slow in the beginning in spite of the hot weather. Turns out, I followed the wrong recipe for the starter. Dumped everything in the bin and started again. This time following the trusted King Arthur site for making my own sourdough starter. After 5 days when it should have been about ready, I got a shock when I found a yellow film on top and an awful smell. Then I decided to ask for help on the Bread Baker’s FB page. Anshie and Karen responded and advised me to use the discard. Fed it and kept an eye and this time, made sure sure sure that the spoon I was using was squeaky clean. Now my starter is pretty strong and I think I should name it Princess like so many other do… Princess because it needs to be pampered a lot. Frankly I think its easier looking after my son’s cat Pumkin than a starter. I used the discard to bake a focaccia, made some crumpets, and made a plain loaf using starter and a bit of yeast all quite successful.For this theme I had to share my first ever pretty okay loaf of cinnamon raisin sourdough bread (without any dry yeast) though the top was flat. The crust was crunchy and the crumb soft. I now know why the top was flat and not domed…. Over rising. I couldn’t bake it on time after the second rise as we had a power cut. In Montreal we had once bought a sourdough bread which was slightly sweet and had apple pieces in it along with walnuts and raisins. So, that’s what I wanted to bake a sweet sourdough bread. Best ever combination, a bit of sweetness and a bit of sourness. Before I share the recipe with you I must mention that Karen is an awesome baker. If she lived near me either of the two would happen; I don’t think I’d want to bake my own breads, I’d rather get them from her or I would learn how to bake delicious drool worthy breads from her. Oh well, the distance between Kenya and US is enormous! Check out her blog, Karen’s Kitchen Stories. 1. Mix flours, salt and sugar together. 2. Mix water and the sourdough starter in another bowl. 3. Add the sourdough mixture to the flour mixture and form a dough. 4. Mix the dough for 5 minutes till it becomes a bit elastic. I used the bread dough hook. 5. Grease a bowl lightly with butter. 6. Tip the dough into the bowl. Cover it with a tea towel or cling film. 7. Let the dough rise overnight in a warm place. 8. Next day dust the work top with some flour. 9. Remove the dough from the bowl and bring it together. 10.Pat it into a rectangle about ½” thick. 11.Evenly spread the raisins and cinnamon over the rectangle, leaving about an inch space at the sides. 12.Roll the dough into a tight swiss roll. 13. Pinch the seams and tuck in the ends. 14.Add some melted butter to the tin, brush the sides too. 15.Place the dough into a greased loaf tin. 16.Brush the remaining butter over the dough. 17.Let it rise again till its double the size, about 3-4 hours. 18.Preheat the oven to 200°C. 19. Bake for 30 minutes till the top is golden brown. 20.Remove the loaf from the oven. 21.Remove it from the tin and let it cool completely on a wire rack. 22.Slice and serve with some butter or jam. I served it with some pecan honey butter. 1. Process the pecans into a coarse powder. 2. Mix the pecan powder, honey, butter and cinnamon together. 3. Pecan honey butter is ready. I made the mistake of keeping my sourdough starter and the yogurt to set side by side. In spite of both being covered, the yogurt turned all slimey. I’ve been making my own yogurt for so many years and this was the first. On googling(what would we do without Google) found out that the natural yeast in the starter may have caused the yogurt to turn stringy and slimey. Start baking sourdough breads with easier ones. I love the idea of a sweet/sourdough bread. This raisin bread looks really great, Mayuri. I haven't named my starter yet, but I love the idea. Since my starter was made from a beer mash I might have to name it “Bud” (from the American beer!). I think that your bread looks delicious even without the dome. I know that if I lived near Karen, I would just let her do the bread baking, at least those with a preferment. Awww. Aren't you sweet!! I love this post. Congratulations on your delicious sourdough bread! I have made one with apples and raisins, and it's really good. Hello Mayuri, our sourdough adventures are quiet similar. I also followed Kingarthurflour for starter. I loved your raisin studded bread. 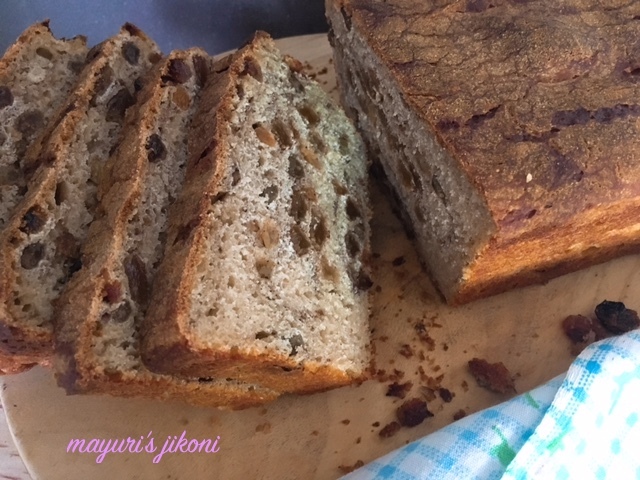 With the starter in my fridge, I would love to try this bread.I can imagine the lovely combination of cinnamon and raisins in your bread. That is an amazing bread Mayuri. Love the addition of apples in a sourdough bread — sounds delicious. So glad you were able to fix your sourdough starter problems. Looking forward for more sourdough recipes from you. Yum! bread wish I could get a slice of it. Cinnamon and Raisin is one of my very favorite combinations! I am still so shaky with my starter! I wish I was more confident. Oh well that's what experience is for right? Beautiful bread Mayuri. I'd say you wee definitely successful! I didn't realise that overproofing would cause a loaf not to dome. I had that issue before and never knew that. Looks like a delicious loaf! Somehow am keeping myself away from sourdough starter, i seriously want to try this starter, hope a day i will. Sourdough bread looks extremely delicious with all those raisins. Excellent bread to kick start a day. Thank you Priya, once you get the starter going, then its easy. Mind you have still not baked those actual 100% hydration sourdough loaves as its need a Dutch Oven, but adding it along with a bit of yeast makes all the difference.